The “end of fixed transit” narratives coming out of the tech industry (and sometimes also from architects and visionaries) are an increasing problem for dense cities, where, as I argued here, the primary need is to provide movement and liberty for vast numbers of people in very little space. Even where ridership is moderate, replacing big vehicles with little ones can only mean more vehicle trips, with all of their congestion and environmental impacts, and if little vehicles are made more cost-effective in labor terms (prior to automation) then this can only be because of a race to the bottom on driver compensation. The key fact to remember: even that low-ridership suburban bus line that looks empty all the time is probably doing at least 10 riders / service hour (that is, per hour that one transit vehicle is running). No ‘door to door’ service can possibly match this; you are not going to take 10 people to their individual doors in an hour, especially if they live as far apart as they usually do in the suburbs. Ten boardings per hour is a dreadful performance for a fixed route and almost unimaginably high for anything demand-responsive to achieve. So the only way for a low-productivity service (riders/service hour) to outcompete big buses is through a race to the bottom on wages and compensation, which has consequences for both service quality and for the larger society. The most urgent thing transit agencies need to do, right now, is start talking more confidently about what their fixed-route, high-ridership transit service is achieving, so that they negotiate with the new players from a position of strength and confidence. More on this soon, but meanwhile there’s a video. It’s from a presentation I did to the Board of Capital Metro, the Austin area transit agency, last month. It’s here, but you need to select “VIII, 1” on the fifth row on the right, to get to the right spot. The presentation is about 40 minutes, and it ranges across many themes, but always comes back to the spatial geometry issue. An interesting presentation – and one that nicely emphasizes the distinction between the ridership and coverage functions of transit. But I’m not sure it’s much of a “pushback” on ridesourcing and microtransit. You effectively make the case that those services cannot compete with heavy ridership bus service based on price *today* – but I think that most of the speculation on technology displacing transit is based more on the advent of fully autonomous vehicles, not the pricing structure when such vehicles have drivers. You note (correctly, IMHO) that buses with drivers can’t compete with autonomous vehicles, given the significance of labor costs – but you didn’t address whether buses *without* drivers can compete with autonomous vehicles based on price. But I was most curious about seeing your “geometry” argument fleshed out a little more, and it was disappointing that it wasn’t. Yes, a bus has a physically smaller footprint than 30 cars – but in a transportation system where 90%+ of commuters are already in cars (like Austin’s), it only takes a very small increase in automotive efficiency to accommodate the ~4% of people who are riding in buses during the peak hour. You just don’t have that many people being served by transit, so it doesn’t take much efficiency gain to create the “space” needed to accommodate them in smaller autonomous vehicles. Much less than the 20% you noted in your presentation. Is the dividing line between transit systems that get displaced by autonomous ridesourcing *really* between “urban” and “suburban,” or is it between superdense CBD’s and other urban areas where cars are already the overwhelmingly dominant mode? I would argue that you don’t need “superdense CBD’s”. A city filled completely with 5-story apartments (e.g. where I grew up in – cities surrounding Taipei, Taiwan) has sufficient density to cause complete grid lock even if everyone uses ridesharing instead of driving. If you have a city filled with 10-story apartments and a couple of high-rises here and there, you have Tokyo. Now of course in the US, you don’t find many cities filled *completely* with 5-story buildings, which is where Jarrett’s argument seems to fall apart. Urban in US =/= urban in e.g. Asia. In many places in the US, if you could convert enough drivers to use ride-sourcing, and assuming enough funding, it will work. That accommodation won’t last. Induced demand will immediately wipe it out. In my city of only 1.5 m 45% of all peak hour trips are by driving and 45% by fixed route transit in the peak period. I can’t see automotive efficiency doubling around that many pedestrians as the entire CBD is basically gridlocked already. Not all tech companies are advocating the elimination of buses, some want to just take the really bad routes in a system and make them flexible in time and/or stops. Flexible route deviation is the future in my opinion. Based on reports by the Transit Cooperative Research Board, these services are not always as unproductive as people claim. Now the average might be low, but I would argue there are many more places where this service would shine if the appropriate demand studies are done and a good service is provided. And once these deviated routes encourage enough ridership, the productive ones could be moved to frequent fixed routes. In this way transit can “colonize” areas where it was once unable to cover. Of course a “door to door” service can match this. The would just do it with more than one vehicle – a half-dozen cars would likely suffice to match that boarding frequency. However, that’s not economically competitive if every vehicle needs a driver – with or without a ‘race to the bottom’. But it *could* be economically competitive with driverless cars. If autonomy reaches a price point where widespread adoption is possible, then it’s going to be *cheaper* to buy a half-dozen autonomous cars than an autonomous city bus. Since a small car is five times more fuel efficient than a bus (or more), there’s not likely to be much difference in operating costs or environmental impact, either. *That’s* the question posed by the Musks of the world – whether fixed-route transit can compete with ride-sourcing once autonomy has made the latter price competitive. Quick googling suggests you can get a new bus for $300k and a new car for $15k, so that 20 cars cost as much as one bus. I suppose the relevant question is what it will cost on top of that for the extra equipment (mainly sensors, but also possibly processors) for making the vehicles autonomous. If that’s $45k per vehicle, then you can get half a dozen self-driving cars for $360k, just over the price of a self-driving bus at $345k. I have no idea if this $45k is an underestimate or an overestimate. Alan. Yes, we know that the calculation changes when taxis are driverless. That solves the labor efficiency problem but not the space efficiency problem, which is still acute in big cities. I think the point being made is that many “big” US cities transit modal share is so abysmal that if you can increase the average occupancy of cars a bit by ride-sharing you can completely replace transit. For example, there’s 80 cars and 1 bus on the road carrying 100 people, You replace that with 50 autonomous cars carrying 2 people each using ride-sharing and you have a net gain in space efficiency! It’s actually a little more direct than that. In a decent number of “big” US cities the transit modal share for commuters (a rough analog to the peak hour) is less than 5%: places like Dallas, Kansas City, Indianapolis, Phoenix, Tampa…or even Austin. It’s highly unlikely that such cities have space efficiency constraints that would keep you from shifting that small amount of ridership into personal cars. Plus, that delta in car usage is within the expected efficiency gains that automation would bring (ie. up to 20%) in the existing passenger cars. Clearly there are cities where such constraints exist. You wouldn’t expect autonomous vehicles to replace transit in cities like Tokyo or NYC or Boston without running into serious space efficiency issues. 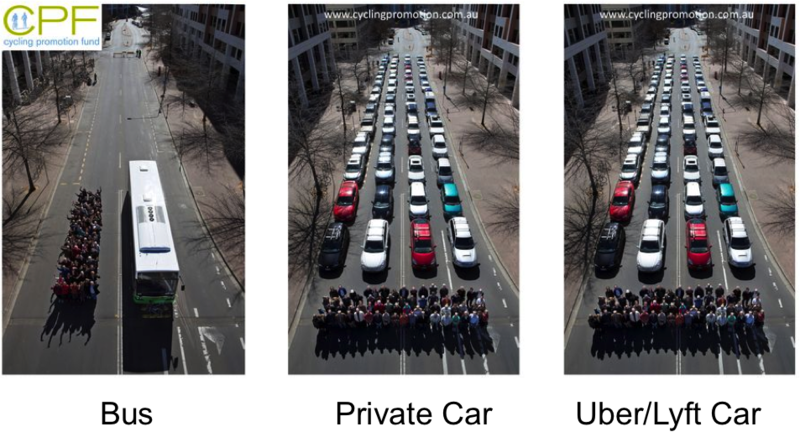 But it would be really interesting to see more of an elaboration of this space efficiency argument – just pointing to the fact that a bus has a smaller physical “footprint” than 30 cars doesn’t help us understand where the space efficiency starts to constrain. To use a trivial example, a bus takes up less space than three midsize sedans with a car length between them – but I would expect that adding a bus to a roadway with frequent stops without pullout bays would have a *worse* impact on traffic flows than adding the three cars. The thing is that the 5% of public transport trips is presumably disproportionately in the most space-constrained situations, such as traveling into the city centre at peak hour, which is one of the main reasons people are on a bus or train rather than a private car in the first place. Even then, I think 5% is still not very much. I don’t have data for these US cities, but let’s assume that only about 30% of commutes are to the city center*, and that all of the 5% peak hour public trips are in this 30%. This translates into about 16% transit modal share for “space-constrained” trips into city-center. If we convert 20% of the cars from single to double occupancy we would’ve solved the space problem. Now I’m not saying that this is a long-term sustainable solution or anything (adopting this solution will place a strict limit on how much the city can grow), but when autonomous cars become cheap, it might be something that is quick and easy to deploy and works relatively well. 2) That once we’ve found a way to accommodate all those EXISTING commuter trips, that’s all the travel demand we care about. But for 1) there are many trips not measured in those data which matter; all the students who walk to their “job” on campus or seniors who cannot drive but walk in their neighbourhood but aren’t strictly commuters would be just two examples. All leisure and shopping trips are also by definition excluded. For 2), let’s assume there’s some proportion of the population who are unemployed but seeking work. In a lot of cases, they simply can’t get to the job because they can’t access it. They may even have a car but suburban sprawl or congestion prevents them from getting there in a reasonable time. In both of these cases, the main point is the one Jarrett takes such pains to emphasize in his presentation: transit unlocks economic growth beyond the constraints of congestion/sprawl. Imagine all the extra trips you might take if you knew the majority of attractive and desireable places in your urban area were accessible by fixed route transit within say 30 minutes, without you having to think about it? Those destinations by their nature are not easily reached by car, at least not by most of us, autonomous or otherwise. That’s the geometry/economic problem fixed route transit is best at solving. My argument is based on trying to get a conservative figure for “transit modal share for space-constrained trips at peak hour*” and the intuition is that if overall transit modal share is < 5% it won't be too high for these space-constrained trips either. My point is that by my rough calculation it should be low enough for replacement by autonomous ride-sharing. I tried to estimate this number using commute data so what I really got was "transit modal share for space-constrained commute trips at peak hour". However I think this number should also be reasonably good for *all* such trips including non-commute ones and won't harm my argument, because non-commuter trips probably have lower transit modal share (correct me if I'm wrong) and they should be a minority of peak hour traffic anyways. * if we can handle peak hour with autonomous ride-sharing, we can handle off-peak as well. For 2) yes I think that is a fair point. If this ride-sharing thing with autonomous cars really works as advertised induced demand could wipe out the space efficiency gains. It's also a very very bad idea to plan for present demand only. 1) I looked to “commuter” trips because those are (generally) the trips that take place during the most constrained part of the day, when spacial limitations are most acute. Outside of a very small handful of metros, the existing roadway network could handle shifting all transit users into passenger cars outside of the AM/PM peak hours, which roughly correspond to commuting traffic. Transit has an even lower mode share outside of the commute, at least in the U.S.
(Of course, that is probably somewhat skewed by NYC metro’s massive share of transit ridership, but still we should be wary of assuming that there are people who are deterred from travel by private car commutes that are longer than transit would take). It’s tempting to argue that if transit only serves 10% of the trips overall, that a conversion of 20% of the car drivers from single-occupancy to double-occupancy would free up enough space to replace transit. The problem with that argument is that the 10% of trips that transit does serve are usually not random trips scattered throughout the region – they are concentrated in the middle of the city and during peak commute hours. So, trying to replace transit completely with ride-sourcing does run against the fundamental geometry limitation that Jarett is alluding to. In many cities, transit is also able to achieve time advantages by using a dedicated right-of-way (such as a subway tunnel) that completely bypasses car congestion. Compared to roads, subway tunnels have very little capacity in terms of vehicles per hour; they work only because a small number of vehicles per hour can still carry a very large number of people per hour. First, it would be in the ride hailing service’s interest to minimize capital investment by maximizing sharing during peak periods. Second, the sharing service’s computer will know every user’s origin and destination, making it easy to match riders, even in low density suburbs. Ideally, there would be a single database connecting all riders. The idea that heavily subsidized public transit will continue to be the primary general purpose alternative to privately owned SOV’s in the not-too-distant future is questionable at best. in the average american urban locality, sure, but not in any place that is big and dense enough to have subways. You can’t code your way out of physics. I’m curious how you would interpret this issue in light of a low density area. For example, my home UZA in a rural area is stretched over a large area (at least 6 different separate towns) with just 88,000 residents. It has a small transit system running 15 fixed route vehicles with hour or more headways. It would be hard to make the case that this system does anything for congestion relief. Indeed, there isn’t much congestion to speak of. It’s really just a coverage system to provide options to those that need or want them. While I completely agree with your geometry argument in larger urban areas, do you see a possible future where the capital and operating costs of a subsidized autonomous fleet of cars justifies replacing transit in this type of area, where road capacity is a non-issue? I think his examples of sururban last mile issues being solved by autonomous vehicles apply here. That’s a pure coverage service that will probably die. And it’s a good thing : those are wasteful. With more intelligence, big capacity transport devices will be used only where their capacity is needed : in town whith high density. Those are not common in the USA, from what I gather here or there, but here in ol’Europe, it’s bread and butter. I’m especially thinking about the Parisian area where I lived for decades, and where there is nearly no place to build new roads. Everything is overcrowded, the streets, the bus lanes, the tram lanes, the subway, the suburban trains. Up to a point. Then you reach the far suburb, and suddenly, there is space and wasteful bus lines. Like the heavily subsidized small service that links the busy train station in Taverny(4 trains per hour to Paris, 1844 places each) to the forest hamlet of Montubois-la-Chicaille. Around 100 inhabitants, more horses than human beings. This is typically where the new technologies will begin to shine. The border will be really clear. I can draw it on a map, already. In other towns, it will be more mixed. A smaller but dynamic town as Montpellier(270,000, 580,000 with the uban area) where I live now will always need mass transit for its hyper-centre-town, a medieval town where no car can pass. And a few, very dense new areas, like the South-East where I live(Port Marianne, Antigone, Près d’Arènes), or some parts of the West(Sabines, Paillade, Mosson). All the rest is the paradise for motorcars, and will be ideal for the upcoming toys for individual beings. yeah it has to be seen what driverless vehicles really can do economically and congestion-wise. At the beginning when they’re mixed with human drivers and fleets are smallish or non-standardized, probably not much. Also they will cause induced consumption of mobility because of how easy it is to use them (e.g. to go to a place where there is no parking and you’d now walk or take transit even if you’re middle class). This in turn can lead to something which is already talked about: time- and place-dependent road pricing. Privacy and technical concerns stop this from being implemented, but when autonomous vehicles reach critical mass, there will be no barriers anymore. This will artificially drive the price up to keep congestion down, and move more people to public transit, with the hope that this ensures the best outcome for the collectivity (as gridlock clearly doesn’t). What’s clear is that low-density areas that have low traffic will never be touched by these issues, so the case for driverless taxis replacing coverage service is very strong. There are plenty of places in my mountainous country where this will happen. The problem is that public transport here is so pricey while the cost of roads is more shared so urban public transportation (not trains that take commuters to nearby bigger cities as the pre-existing traffic stops that from happening) can really get killed in medium cities if they don’t implement road pricing fast enough, creating an era of gridlock until there is political movement for road pricing. Will driverless buses be able to spot people waiting at bus stops and know to stop for them? Presumably they’ll be able to do everything else – drive in traffic, serve stops, recognize requests from people on the bus, etc, but spotting riders at bus stops is something I can’t quite figure out how they would be able to handle. Driverless trains make all stops, elevators have buttons at each floor, etc … so this seems like a new problem and potential barrier. You could put buttons at all the stops I suppose but that might be expensive, prone to failure, abuse, or people not knowing to use them, etc. even elevator buttons do get abused, by kids who make the elevator go up and down. But what damage is really done by making a bus stop where it’s not necessary? Almost none at all if the travel time is calculated assuming all stops are made. This is very unlike making an elevator go to the top when there are other people down below waiting to use it. The stop buttons inside the bus get abused now too, by kids. 1. implement buttons connected to the bus either directly via wifi or a camera-readable signals, you can come up with something very low tech, like a IR beacon that gets turned on for X minutes when you press the button. 2. have an operator in the command centre say whether the bus has to stop or not, if live CCTV of the stops or a live video feed from the bus is available. The really interesting piece of this is that Capital Metro was using uber and lyft as one of three major excuses for a big drop in ridership over the last few years (rather than pointing correctly at the botched implementation of fake-BRT). Jarrett (albeit way too gently) made it harder for the public to believe THAT excuse. (Excuse #2 – land use – also bogus, as it has improved on the 1/801 corridor dramatically, but service cuts led to ridership drops). (Excuse #3 – rain – also bogus, unless you think it rains more in Austin than in Houston). Wasn’t the red line barely functional over the same time? And they were single-tracking some lines for work they WERE NOT DOING? Sorry, wrong capital. Austin’s excuses are bunk. Jarrett, what do you think of Uber’s latest offering, Uberpool for $2 vs. $2.25 for Muni? The problem with the image above is that shared ride-hailing isn’t mentioned. UberPOOL and Lyft Line give the possibility of 2-4 unrelated trips in one car per direction (this is assuming that they don’t expand to 7 or 14 passenger vans, which they may), and there’s no need for parking. That’s an immense geographic advantage over people driving their own cars alone and needing somewhere to put them. In terms of geometry, we may notice road congestion in cities, but the streets are not the place with the most cars- L.A. is about 50% car-related land use by area, Dallas and Houston closer to 70%. Very little of this is actual roadway, most is parking. Much of this may be due to parking minimum regulations, but even in the absence of those regulations, businesses (whether home builders, condo associations, or consumer-facing retail etc) provide parking because they assume that cars bring customers, or vice versa. So, once the regulations (e.g. parking minimums) are removed, what people actually tend to do ends up having a big influence on future land use. It’s possible that in certain cases, we could could get more people into fewer cars, without slowing down buses, possibly without reducing bus ridership. Furthermore, gathering political will from those who don’t take public transport to support more bus lanes may be easier if they knew that when they needed to get to/from the airport at rush hour, they would have a lane without the usual congestion, if they were in an UberPOOL/Lyft Line. That means more lanes better buses for transit users. I agree with you that it’s not a positive development to get people out of buses or trains and into smaller vehicles in times of congestion where geographic spaces are limited. However, outside of those situations, if ride-hailing services make it easier to not own a car, that’s a positive development. Whether your usual way around is biking, bus, carpool, or walking, the availability of ride-hailing services makes it easier to navigate with the limitations of those forms of transit without having to fall back on your own car- if you don’t need it, you might get rid of it. In the absence of regulations, individuals will try to get more out of the land. If a business notices that its parking lot is perennially half-empty even when its store is full, they may be willing to let a shipping container coffee shop or food truck permanently occupy that space. Someone who doesn’t need a car may decide to convert their empty driveway or garage into a granny flat for some extra income. Gradual thickening, the same kind of incremental development that built america up until about 70 years ago, would steadily do that, if it’s legally allowed to happen. It’s going to be slow. We didn’t get this screwed up very quickly either. There’s places in the US where we simply will not get fixed-route transit to be up to the standard of reducing the number of vehicles a household needs to own, due to political will or simply scarce resources (A road we can’t afford to repave probably can’t support bus service, either). But in some places we’ll be able to get there from ride-hailing, and even more via shared ride-hailing. Anything that can reduce the rates of car-ownership on the margin, without reducing living standard, should be celebrated as making for a healthier (in social, mental, and physical sense) population.